Materials are really what you make of them and in an artist’s or masters hands the most simple and mundane can become truly extraordinary. I am always in awe of people who can create like this, less so because of the idea itself and more so, for me, because it takes tremendous patience and attention to detail to create such pieces. Patience and attention to minute detail are traits I can struggle with. 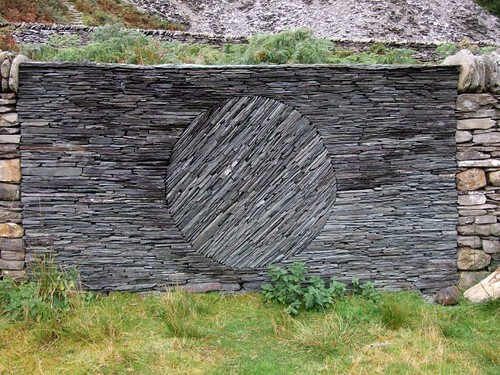 These amazing shots of detail oriented dry stone work simply blow me away. It’s in the Lakes near Coniston. Head north out of town, take your first left (about 2km) up a minor road signposted (I think) to High Tilberthwaite. This is on your right after approx 2km. There is a car park on the left. 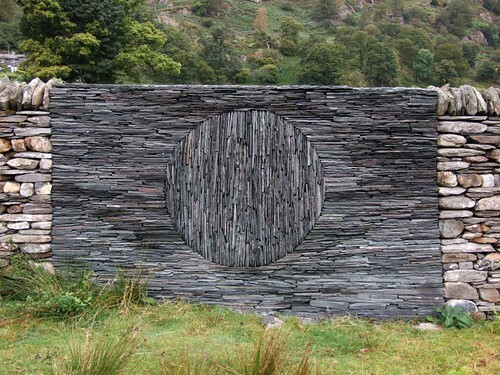 As I consider taking inspiration from these shots, I wonder which of the stone masons that I know could create such a thing and being the DIY person that I am, I consider also if I could do this. The answer to the second question is ‘no’, the first I am still pondering. Sometime ago, the ugly red blue and green slate sales man came to New England and made a killing. I get called to properties using this product often. The slate is simply too thin to last as a patio surface but I always feel so bad tossing it away. I am thinking that there might be a second life for it….broken into small pieces and used with regular field stone to make walls inspired by these images. What inspiration do you take from this work? That wall is phenomenal! It almost acts as a piece of sculpture… it is definitely a work of art! Also wanted to let you know I have listed your blog on my blog roll! I have been enjoying reading through it! Really…. stone products add special touches to your beautiful home and garden. You can decorate your home and garden with beautiful, natural and imitation stone materials. Fantastic set of pictures, I sure do hope RoystonVasey doesn’t mind you using them…. With a minimal concept, these walls are so strong visually, and are definitely sculpture, not just a wall. Amazing! Great looking walls. I don’t think they would be so technically difficult, but definitely show a wonderful vision. They definitely aren’t the most structurally sound walls ever made, which is not a dis on Goldsworthy. He sees his stonework as art and says he likes the ideas of his walls falling down over time. He likes to intentionally break the rules of stonework, such as stacking stones one on one in the top photo and the running joints for visual effect in the last photos. He’s definitely bold and I love looking at his work. I’ve used the slate turned vertical as low edging. I’ve been skeptical of it stacked too high on the horizontal because it starts to crack from the weight of the stone above it. It can look really good with the courses stacked herringbone, though I’ve never done it, and apparently the walls can last a long time that way.